Thanks to the second post of the series where we obtained data from eBird we know what birds were observed in the county of Constance. Now, not all species’ names mean a lot to me, and even if they did, there are a lot of them. 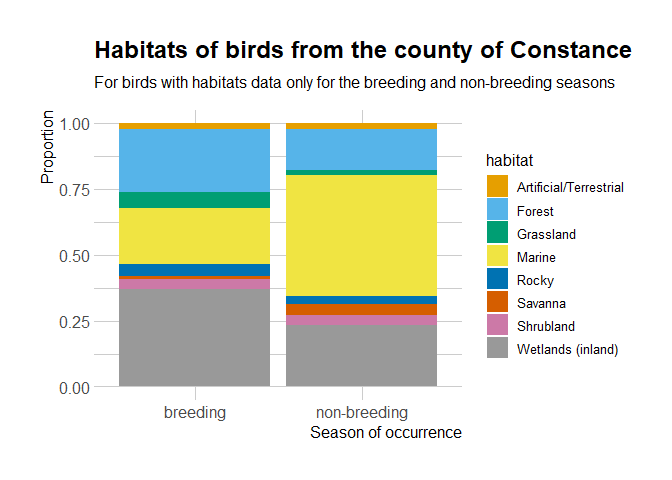 In this post, we shall use rOpenSci’s packages accessing taxonomy and trait data in order to summarize some characteristics of the birds’ population of the county: armed with scientific and common names of birds, we have access to plenty of open data! For more details about the following code, refer to the previous post of the series. The single difference is our adding a step to keep only data for the most recent years. We will also need these two data.frames later: abundance by species, and dictionary of names. In this section I would like to get an idea of how diverse the types of birds are in the County of Constance. I want to draw a phylogenetic tree of the local species, and for that, I’ll first retrieve the classification for each species from NCBI using the taxize package that “allows users to search over many taxonomic data sources for species names (scientific and common) and download up and downstream taxonomic hierarchical information - among other things.”. We first query *uid*’s and then use the classification function, instead of passing the species name directly to classification, because the IDs are unique whereas results for species names aren’t. Rate limiting is thankfully managed by the package itself so we users do not need to worry about that. Now, we’ll represent the whole taxonomy as a tree, using the handy taxize::class2tree function and the great ggtree package by Guangchuang Yu. This tree is… unreadable. But at this point, it’s worth remembering that we got here using three taxize functions only: taxize::get_uid, taxize::classification and taxize::class2tree. What a smooth workflow! We’ll now concentrate on highlighting orders, inspired by this blog post. There are 18 orders and I do not intend to add the highlighting command for each of them by hand! I’ll streamline the process, starting by automatically extracting the node ID of each order. The solution below might be a little over-complicated, so R taxonomy experts, please chime in! 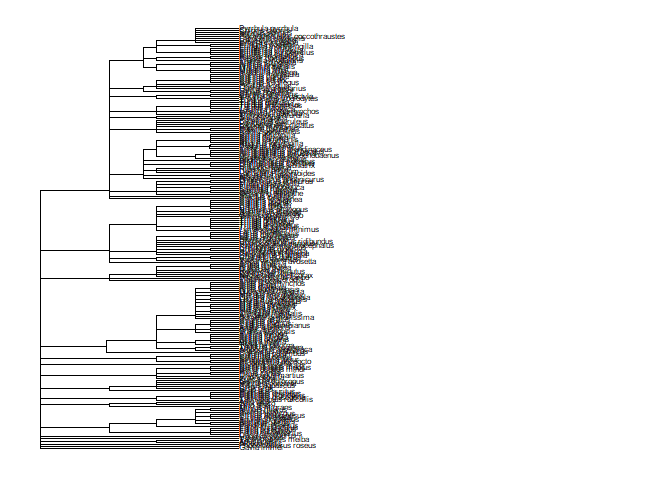 I transformed the tree phylo object to a phylo4 from the phylobase package maintained by François Michonneau, in order to easily retrieve all ancestor nodes for any group of species. Within an order, the order node ID is the highest common node ID. For each order, I’ll get a silhouette from Phylopic using Scott Chamberlain’s rphylopic package. It is rather tricky to automatically get pics from Phylopic since you might not get one for the order itself, maybe one for the subtaxon instead, etc, so we made decisions blindly in the script above. In real life one might prefer selecting IDs by hand. Now, we can highlight each order! One could add silhouettes to the tree itself with ggtree but I’ll add them on the side instead. Once we have created all these PNGs, we can join them into a gif using Jeroen Ooms’ gifski. This gif shows many species names and orders giving us a feeling for what we might encounter in the county of Constance, but it lacks quantitative information about the species. It’d be interesting to create trees such as the ones of the metacoder package to reflect abundance, possibly depending on the very local area (distance to watery area) or season, potentially using the taxize::downstream function to get all families in each order, even families not present in our occurrence dataset. This idea is beyond the scope of this post. What is in scope, now, is trying to get trait information for the species. In ecology, traits are characteristics of organisms such as habitat, body size, threats, etc. It’s a whole bunch of data you can get for free based on species scientific names, from different data providers. The traits package, part of the rOpenSci’s suite, is an interface to various sources of traits data. In this section, we shall use data from BirdLife International: habitat and threats. The script above isn’t the smartest since it doesn’t retain information about the species names. Not too bad here because I want to get a general idea of birds’ habitats and threats over the county. It seems that the birds present in the County of Constance might have different distributions depending on the breeding/non-breeding season. It’d be interesting to look at in the occurrence data, since auk allows zero-filling. As you can see, it is a depressing dataset since most threats are human-made, but such information can help conservation! Instead of diving into the fate of particular species, let’s get a general picture. There are 211 species, for 68 we get an entry in the threats data. What are the most common threats for them, now and in the future? It’s quite similar to the ranking in this post on BirdLife’s website: industrial farming, logging, invasive species, hunting and trapping, climate change. Note that these threats have been summarized by species, not by species and location, so this data doesn’t tell us much about the state of each species in the County of Constance. If we wanted to characterize the County a bit more via the use of open data, we could use e.g. osmdata to get land-use information via OpenStreetMap: instead of bird hides/blinds as in the first post we could get elements related to agriculture for instance. From occurrence data we got names of species observed at least once in the area over the last year. Using taxonomy data to classify them we were able to see quite a few birds orders are represented, and we were able to visualize corresponding silhouettes. Traits data is general and doesn’t give information about the local context of birds in the County of Constance, however it could be coupled with more local data: localization of observations, and open geographical data. All the mentioned data sources are available for free, and can be obtained using R packages, cf the first and second post of the series. There are many R packages supporting your taxonomy work! In particular, within the rOpenSci suite taxize that we used here allows to get taxonomy information from many sources and is the topic of a WIP online book, while taxa, maintained by Zachary Foster, defines taxonomy classes for R. rOpenSci maintains a task view of taxonomy packages here, part of which form the rOpenSci taxonomy suite. Related to taxonomy are phylogenetics. The treeio package by Guangchuang Yu provides base classes and functions for phylogenetic tree input and output and was onboarded. Guangchuang Yu’s other packages such as ggtree and tidytree are also of interest for manipulating and visualizing trees. More generally, the Phylogenetics CRAN task view provides a sorted useful list of packages. Based on species’ names, one can also get traits data using the traits package as we did in this post. Also of interest is the rOpenSci’s originr package providing different datasets about invasive and alien species. Explore more of our packages suite, including and beyond the taxonomy and traits category, here. Stay tuned for the next and last post in this series, about querying the scientific literature and scientific open data for the bird species occurring in the county! In the meantime, happy birding!